When purchasing a car trailer that is required to haul several considerations must be made. A basic but fundamental issue is the length of the trailer. When purchasing a goose neck trailer there generally exists an eight foot area in the front of the trailer that connects to the tow vehicle. This area is generally counted in the length of the trailer and needs to be subtracted from the overall length to calculate floor length. This is to say a 48′ trailer offers 40′ of floor space. Do not make the mistake of buying a 40′ trailer and only having 32′ of floor length. A 32′ trailer is not likely to be suitable for a 2 car trailer. 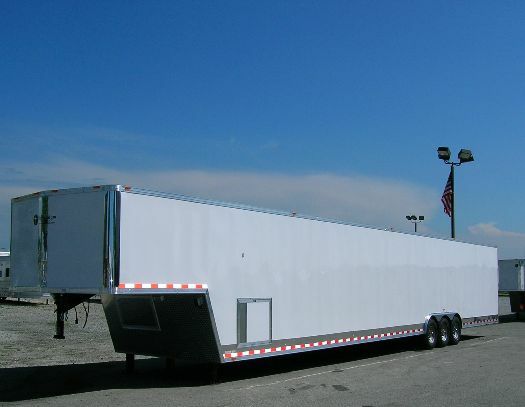 If you are considering stacker trailers, then a 40′ would likely allow 3 cars to be hauled. It will be critical to secure a car in a trailer that will be traveling at any speed. Currently two systems exist for securing cars so that they do not move during transit. The classic type of tie down is called a D-Ring. Not all D-Rings are created equal. Make sure to purchase D-Rings capable of securing your load. Most trailer manufacturers over varying weights. 4 or more D-rings are required to secure each car. Another popular option is E-Track. E-Track is secured to the floor in two or more rows and is attached with a clip system. E-Track is more flexible than D-Rings in that is allows a tie down to be placed every few inches. This is a necessity if different cars are being put in the trailer at different times. There are many other considerations that we can discuss with you. Just call 1-800-978-7223 to speak with a design specialist.